Celebrate the work of wetlands champions around the country who have shown outstanding dedication to the protection of our natoin's wetland resources! The event is free and open to the public! RSVP required for admittance. Donations (optional) will help support the National Wetlands Awards program. Every fall, we solicit nominations to recognize new wetlands champions to recognize in American Wetlands Month in May. 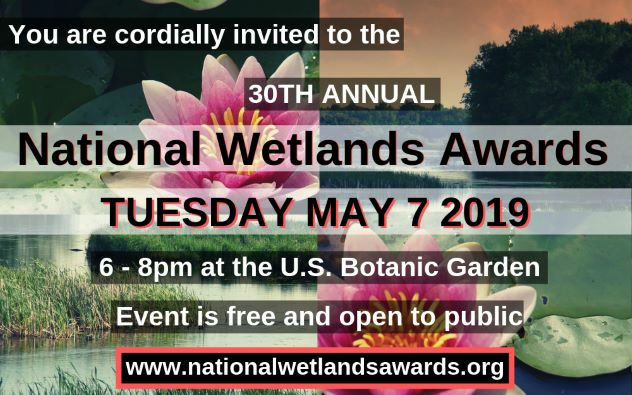 To learn about future opportunities to nominate candidates or attend the Awards, follow us on Twitter (@ELI_Wetlands) or join our Wetlands and Waters listserv (wetlands@eli.org).